I've ridden a fix on and off for the last four years, occasionally commuting when the distance is suitable. But it took the loss of my old gearie Centurion to make me try fixed offroading. I was scouring the local thrift shops for a replacement bike when I came across a tourer hidden behind the ubiquitous pile of worthless Huffies. It was a Victoria, a German make I'd never heard of. Cheaply built, too small, and with a cheap Simplex gruppo, mostly bust. But it had two redeeming qualities: a longish top tube and 700x45c knobbies. I took it home. Off came the cottered cranks and steel wheels. 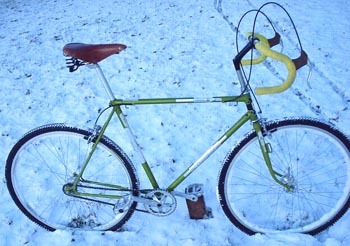 I substituted 38/42 rings and a 17t Surly cog, and wheels I'd laced up the previouswinter for an abandoned project. I added 700x42 WTB treads, good for dealing with sand while riding the Snake River canyon in search of Indian rock art. Victoria handles surprisingly well despite her awkward looks. I love the feeling of control I get while bumping over fallow pastures and old rail grades. No need to interrupt the flow with brakes. This fixing is catching! More fine-tuning to come with warm weather and clipless pedals. Watch this space. Darcy Warn put up his first 'Bikes For Sale' notice at the age of 8. He blames his recent conversion to fixed on Sheldon Brown. Here's some of the glyphs Darcy goes to see on Victoria.